RadTreeList uses skins to control its overall look-and-feel. A skin is a set of images and a CSS stylesheet that can be applied to the control elements (items, images, etc.) and defines their look and feel. By default all controls in UI for ASP.NET AJAX suite have a polished look and feel which is consistent across the whole product line. These are the skins provided by Telerik. They are embedded in the Telerik.Web.UI.dll assembly as web resources. To use a built-in skin the user only needs to set the Skin property of the control. Built-in skins are also provided in "C:\Program Files\Progress\UI for ASP.NET AJAX RX YYYY\Skins". 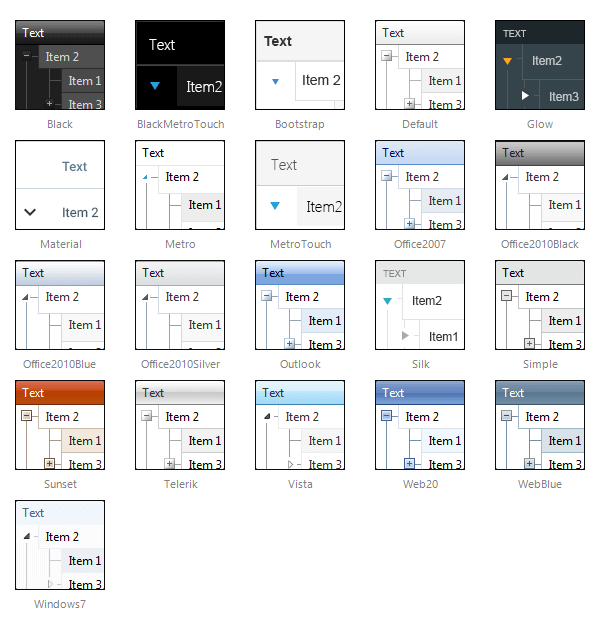 With Q2 2011 release of UI for ASP.NET AJAX RadTreeList has four new skins (Transparent + Office2010 variations). To use them you should add the Telerik.Web.UI.Skins assembly to your Bin folder. For more information refer to this blog post. Since Q3 2011 all the built-in skins (except the Default one) have been relocated to the Telerik.Web.UI.Skins.dll assembly.Also new Metro skin has been added for RadTreeList. Since Q1 2013 three new skins have been added for RadTreeList(BlackMetroTouch, Glow and Silk). These are skins created by the developer. They are not embedded so the control cannot register them automatically. If you use a custom skin you need to set the Skin property, and the EnableEmbeddedSkins property of the treelist control to false. If you do not do so, an exception will be thrown saying that there is no embedded skin matching the Skin property. Examine the Creating a custom skin help topic for additional information.